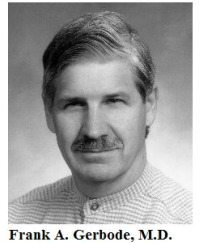 In 1990, I wrote an essay for this Newsletter entitled “A Psychologist Looks at Metapsychology”, which many of you will have seen. In that piece, I talked about my initial entry into this field, included some of my personal history, and outlined the crucial differences between standard psychological techniques and metapsychological ones. This talk is really the next step. At the time I wrote that essay, I was in a transition phase of a continuing journey. Having completed that transition, today I would like to talk about it and about the journey in general. I have actually been making two journeys, as I see it. They are somewhat intertwined. The first is my personal journey through life. The second, laid against the backdrop of the first, is my journey as a clinical psychologist with my clients (or viewers) through the process of therapy (facilitation). You will notice that I am using both the psychology and Applied Metapsychology terms here. That is because I am going to speak from both frameworks. So please indulge me. I want to begin where I left off in the essay I wrote during the transition. At that time, I was approaching completion of my training in Applied Metapsychology in England. I had finished the General Facilitator Course [later replaced by the Ability Enhancement Workshop Series – Editor Note] and was just beginning the technical director/supervisor training while concurrently doing an internship. At that time, I was thinking in terms of both psychology theory and Applied Metapsychology theory. By this, I mean simply that when I first saw a client or viewer, I found myself conceptualizing the case in both ways. I was still focusing on the similarities and differences between the two. A case in point: my views concerning diagnosis. Though I have always firmly believed that labeling people is wrong, and that labeling the condition too often becomes labeling the person, my prior training in clinical psychology emphasized the value and utility of diagnosis – particularly in determining treatment planning. Consequently, when I started working with viewers, I still fit them into certain diagnostic categories. In so doing, I was indeed labeling the person rather than the condition. How, you may ask, did this happen, given the fact that my convictions about not labeling people were so strong? Habit is one answer I can give, but it’s not a very satisfactory one. The actual change in thinking began when I was looking at the metapsychological concept of “having” – a concept that remains undefined in standard psychology. In his book Beyond Psychology, Dr. Gerbode talks about the ability to have as a basic ability that all people possess to varying degrees. He defines “having” as “the ability to be causative (or to act) with respect to an entity.” He defines “entity” as “an object, event or relationship (state of affairs) that is part of a person’s world, i.e. which exists, for a person, at a certain moment”. He talks about the two ways in which we use the term “to have”. The first is in referring to things external to our current identity; thus, for example, “I have a blue suit.” The second is in referring to things internal or connected with our current identity; thus, “I have a bad temper.” It was recognizing the confusion between these two usages that really changed my thinking about diagnosis. I thought a lot about the ways in which we use – and confuse – the concepts of being and having. We often think of people in terms of their identities. For example, I might consider that John, a friend, “is intelligent”. Very few people would be offended by such a statement. However, a better way of putting it would be to say “John has a high IQ.” Or “John has intelligence.” The distinction may seem subtle, but it is important. “John has a high I.Q.” or “John has intelligence” is a better way of expressing it, because although John’s current identity may include being very intelligent, John as a person – his core identity – cannot be described solely with the statement that he is intelligent. And John can “step back from” his current identity – that “package” of qualities that he is “being” at the moment – and see the quality of intelligence as something he has (and therefore as something he can do something about), rather than thinking that it’s just the way he is. The distinction becomes clearer if we use a negative trait to describe the person. For example, if we were to say “John has a mental illness,” we imply something quite different from what we imply in stating that “John is mentally ill.” In the first instance, we are describing the condition John has as something distinctly separate from himself or his core identity. In the second, we are describing John’s core identity – who he fundamentally is – as being mentally ill.
Again, while this may seem to be a subtle distinction, it is actually powerful and important. When we say someone is something, we imply that the characteristic cannot be changed. We view – and suggest that others view – this characteristic as something inherent in the person’s core identity. Whereas, when we say someone has something, we are implying that the characteristic can be changed because it is external to the being’s core identity. We imply that it is one facet or possession, rather than a description of the whole. It is important to note that in talking about what people have, I do not wish to validate the popular psychology idea of “having a disease”. In recent years, it has become fashionable to say that people have the disease of alcoholism, meaning that alcoholism is a characteristic of them. The problem I have with this is that usually it is given as a reason for the person’s being unable to change his condition; it gives responsibility and causation away. In labeling the condition a physical one that is simply part of the person and that therefore has no cure, we imply that there is nothing that can be done to change it. People at Alcoholics Anonymous meetings state, “My name is and I am an alcoholic. ” Alcoholism is thus seen as an integral as well as unalterable part of the person. While I am the first to admit that substance abuse is one of the most difficult areas to treat, I am not willing to assign those that abuse alcohol a label that implies that their behavior and resultant condition can never successfully be altered. As psychiatrists or psychologists, we commonly refer to someone by his diagnosis: “Shirley is anorexic (or an anorexic),” or “Charlie is a psychopath.” Such statements, although meant solely to describe a diagnosis or syndrome the person is exhibiting, in actuality end up constituting an overall description of the person, and one which is very limiting. They also imply that the person cannot change. Once someone has been diagnosed as having schizophrenia, he becomes “a schizophrenic” and retains that label for the rest of his life. If we look at Dr. Gerbode’s definition of having, when we say someone has a condition, we are implying that it is something he can be causative over and therefore something that he can change. In order to have a condition, character trait, or personality trait, one must have access to it and influence on it-and therefore have the ability to be causative or to act causatively with respect to it. Conceptually, this may be a bit more difficult to grasp than the idea of of simple ownership – of having a car, or having a house. But take the example of “having a relationship” with another person. In order to have a relationship, one must have access to the other person (be able to perceive him, understand him, receive communication from him) and to have influence on the other person (be able to communicate to him, do things with him, act on him, etc.) One could not reasonably be said to have a relationship with another person with no interaction ever occurring between the two people. Take another example: having a condition like schizophrenia. In order to have schizophrenia – in the sense that I now use the word one would have to have access to the condition (experiencing its symptoms) and, potentially, one would be able to influence the condition. One could change it. The degree to which we” have” corresponds to the degree to which we believe we embody access or influence on the object, person, perception, characteristic, phenomenon or condition. Often, people determine how happy are or how well they are doing in life by what they have, in terms both of material objects and of non-material phenomena – autos and anxieties, pools and paranoia, savings and symptoms. This explains how a person who appears to “have everything” can feel that he in fact “has nothing”. And has anxiety – access to the symptoms, but no feeling he has influence over them. And he has depression – access to the symptoms but, again, no feeling that he can influence them in any way. Conversely, someone who looks as though he “has nothing” can in fact feel he “has everything”. Jeff has no house, no job, little money and few possessions, fair health, his looks (such as they are), plans, and goals. From his viewpoint, he has what he needs. In his own estimation, he is adequately housed, able to find work, and he perceives himself as having access to and the ability to influence his health and his looks, as well as access to and the ability to affect his plans and goals. He feels, in short, that he has what he presently needs and wishes. The amount a person has of both external and internal phenomena – are central issues in how productive, satisfied, and happy he is in his current life. This area is frequently addressed in facilitation. In fact, when a person has successfully rid himself of a lot of charge, negative habits and behavior patterns, he often will experience a drop in “having” – a feeling of loss – simply because he has reduced the quantity of phenomena that he has access to and influence on, and has reduced the ways in which he has in the past been causative in relation to himself and other people. When a person considers himself to have less than what he requires or desires internally, he will frequently attempt to “boost” what he does have by taking on negative conditions or substituting external phenomena for internal ones. The person who eats sweets because she feels blue and doesn’t have enough love or emotional nourishment is such a one, as is the person who drinks excessively because she doesn’t have enough pleasant or relaxed feelings. When I came to fully understand this concept of having, I stopped thinking in terms of diagnosis. The fact that a viewer had a diagnosable condition didn’t lead to any kind of treatment plan and really added no extra information about a case (unless I was trying to get insurance reimbursement). Eventually, I could no longer find any valid reasons to think in terms of diagnosis. Instead, I began to think in terms of facilitation techniques to handle what the viewer presented to me. At this point, the only time I think in terms of diagnosis is when I have a viewer that may have a condition that makes facilitation difficult or impossible. This is a rare occasion. Anyway, back to my journey. Somewhere during my technical director training and my internships following it, the theoretical underpinnings and basic assumptions of Applied Metapsychology really became integrated. 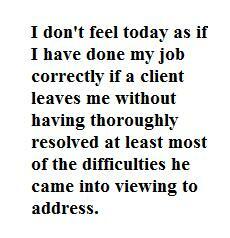 I was still at the stage where, upon meeting a client for the first time, I had a choice as to how to handle him. I could use the techniques of standard psychology or of Applied Metapsychology, but I no longer felt I could mix the two effectively. When did that happen? I’m not really sure. But somewhere along the way, I realized that the basic Rules of Facilitation were not only better but really necessary for long term resolution of psychological issues in therapy. That may sound like a pretty strong statement to make. It is. I came to this conclusion by looking at what happens in therapy and in life when I or anyone else violates them. One of the Rules states, in essence, “Thou shalt not interpret for the client.” I started with that one, fairly easy for me, because interpretation had always seemed to me a most glaring error in therapeutic technique. I knew from personal experience as both client and therapist that interpretations are often rejected by the client. I had discovered that the reasons for this were varied. One reason was the obvious: the interpretation offered is simply wrong. This one didn’t require explanation. It is commonly assumed in psychoanalytic practice that if the client rejects the analyst’s interpretation, it means that the analyst is “encountering resistance”, or that the client is “in denial”. There is no suggestion that the analyst could be wrong. Another reason was less obvious: the interpretation is right, but the client “isn’t ready to accept it”. Translation: the client isn’t yet aware or responsible enough to accept the interpretation. But even if the client were able to accept the interpretation, the fact that he himself isn’t the originator of this piece of wisdom makes a big difference. In facilitation, viewers often come up with realizations that sound exactly like classic psychoanalytic interpretations: “It was a decision I made when I was being potty trained – that I somehow always had to be neat and perfect – that caused this!” The difference is that the viewer has realized this; he has not been fed it by the facilitator. And when you come to realize something yourself, you know it, and that allows you to resolve once and for all the issue that the realization relates to. Not surprisingly, it also creates a tremendous feeling of release and freedom. Somewhere along the way, I realized that the basic Rules of Facilitation were really necessary for long term resolution of psychological issues in therapy. I came to this conclusion by looking at what happens in therapy and in life when I or anyone else violates them. I began by forswearing interpretation. I learned from experience that no matter what pearls of wisdom I imparted in a therapy session, they didn’t have the positive impact that the client’s own realizations had. Furthermore, I found – not as a therapist, but as a facilitator – that when I did nothing but acknowledge and direct the client’s attention, the impact was even more profound. The viewer would sort it out for himself. As I have said before, this is empowering and helps the viewer to be more causative. Another thing I learned from experience was that in standard therapy, it was often the things I said to which I didn’t attach much importance – that I didn’t think were particularly polished pearls of wisdom – that had the most impact on my client. Whatever it was that I said would simply “spark off” something for the client … cause or enable him to inspect something new… to realize something all on his own. And upon reflection, I came to realize that such catalytic communications on my part were seldom if ever interpretations, judgments, or suggestions. Rather, they were simply questions or acknowledgements. Most of this pondering and comparing and evaluating I did not do consciously. It came to me in the form of realizations as I found myself using the Applied Metapsychology techniques more and more and the tools of standard psychology less and less. At this time I frequently asked my clients at the end of a program of facilitation or a course of therapy what they felt they had gained from the treatment. Consistently, viewers reported having resolved issues “once and for all”, knowing with certainty the issues would not come back to haunt them. Many of my viewers tested this out by deliberately putting themselves in situations that would have triggered a lot of stuff in the past or by deciding to handle people with whom they had consistently had difficulty, much as we are wont, with some trepidation, to explore a broken and previously painful and sensitive tooth with our tongue after the dentist has repaired it. Routinely, they reported to me that they had been successful. The joy on their faces is indescribable. The second context is in more standard therapy methods where “letting go” is linked to “working through”. A client “works through” something so he can “let go of it”. The problem I have always had with all uses of the term “letting go” was that no one could ever tell me how to do it! No one had the slightest idea how to teach someone to “let go”, let alone how to “let go and be yourself”. There was no program to let go, no definition of what letting go felt like, no point at which you knew you had let go. I found this all terribly frustrating as both a client and a clinician. The problem was that the basic idea itself felt right to me. The idea that in order to be happy and productive in the present one had to let go of the past made sense to me. I just couldn’t figure out how to do it… or how to help someone else do it. The standard therapy usage of this “working through” concept was even more frustrating. What does “working through” something actually mean? How do I help someone to work through something? It’s a fuzzy term. When I asked people in the field, they usually said you work through by using interpretation, evaluation, or “unconditional positive regard”, or they said it was “just the process of therapy”. None of these were satisfactory answers, as far as I was concerned. I never felt comfortable with “working through” as a step in a treatment plan. In Mardi Horowitz’ work on brief psychodynamic therapy for PTSD, this is the step that used to make me really angry. It’s the step on the program that talks about “working through the issues” and “working through the transference issues”. There is also the step that involves “working through resistances”. He never says how one is supposed to do this. Nowhere in any of my graduate level psychology books, in fact, does one find a step by step guide to “working through” an issue with a client. So, how does Applied Metapsychology view the concepts of “working through” and “letting go”? I realized that in asking someone to view an area of concern repetitively – both by using techniques that are repetitive in nature and by using a variety of techniques sequentially to address a single area of concern — I am indeed helping him to work through it. My new definition of “working through”, then, is this: the process of inspecting an area from many different levels and angles until a realization or a number of realizations are produced that resolve that area. Following on that, “letting go” is simply what happens when a client has reached a major end point on an issue. The issue, whatever it was: a trauma, a failure in relationships, or a painful inability, ceases to affect or concern the client. A person has “let go” of something when he has inspected it to a point of resolution and it has ceased to be an ongoing issue in present time. It has become … a part of the past. This is still a difficult concept to describe to new viewers and facilitators. The descriptions of an end point, while very thorough, still don’t handle the fact that most people experientially don’t understand what you are talking about. The best way to teach someone about end points is to enable him to experience one. Once he has done this, he can then give you examples from his past of other end points he has experienced. The point that viewers usually make is that they knew they wouldn’t be forced to leave a session without having handled something completely. They told me that I respected them enough to make sure they were all right before leaving a session. They also told me they felt they came prepared to work in session, despite the fact that they knew it might be painful. They felt able to confront the work because they knew they wouldn’t feel terrible when they left the session. They pointed this out as a major difference between standard “50 minute hours” and the metapsychological approach, mandated by the Rules of Facilitation, of continuing to work until you reach an end point. Many viewers who had past therapy relate anecdotes of times they went to a therapy session and deliberately refrained from getting into whatever issue was upsetting them because they knew they would very likely become upset and leave feeling worse. They also speak of times where they were feeling too good to “get into” an issue in therapy because, again, they would get started and then have to leave feeling worse. I realized recently [in 1993] that I am no longer able to tolerate a client’s leaving a session before reaching an end point. Fortunately, using Applied Metapsychology, I don’t have to. Sometimes, however, circumstances prevent reaching a completely satisfactory end point. I never feel comfortable ending off when this occurs. I recently became aware of just how strongly I feel about this when I was offered the opportunity to do some work in another setting which would have required me to go back to using 50 minute hours. I realized that – given what I know now – I would feel I was being unethical were I to do this, and so turned down the opportunity. All of these observations are reflected in the Rules of Facilitation. When I recognized this, I realized I could no longer feel comfortable breaking these rules with a client. Back to the journey… As it became easier for me to think with the theory behind Metapsychology techniques, I found I could design new techniques and programs to handle most of the situations my clients presented to me. Then I decided to take what was for me the ultimate step teaching others these techniques. 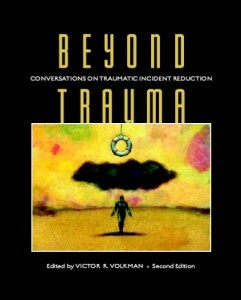 The first few that I taught were lay people, and so I had to learn how to explain the theory of Traumatic Incident Reduction (TIR) and Applied Metapsychology in everyday terms. This was an extremely valuable experience. Like many professionals, I was largely unaware of how much jargon and sophisticated language I used when attempting to communicate to people on the subject of my profession. Through teaching lay people, I learned how to communicate concepts in English so that anyone who tried could understand them. This ability extended beyond explaining the theory of Applied Metapsychology to explaining psychology and other related fields. The more I improved this ability, the better I was able to teach. I found that because I could explain in English, new viewers were better able to understand what they had to do when viewing. And because they understood the techniques better, the viewing went better as well. It also allowed me to communicate the rationale behind what I do for a living without difficulty in ways that made sense to family and friends who are not in the field. When people asked me “What does therapy do?” or “Why do people go into therapy?” I could provide answers that made sense. In some cases, people who I thought would never be interested in any kind of growth or self-improvement became interested after I had given an explanation of the rationale behind TIR. Then I began to teach people who had been trained in standard psychological methods – psychologists and counselors. This required me to think in terms of both theories again. Interestingly enough, I now find myself thinking in metapsychological terms first and then translating back into psychological terms, rather than the reverse. In 1992, when I was teaching a workshop on TIR to a group of counselors, I realized how thoroughly I had made the transition from psychology to Applied Metapsychology. A student asked me if I judged clients out of session or predicted – out of session, to myself or others – what I would find with a given client in session. I actually had to think about this, and I realized that in fact I don’t. I don’t find myself thinking about a viewer’s session data out of session except as it relates to case planning and technical direction – i.e. where do we go from here? I don’t look at a viewer, in or out of session, and think about her issues. In session, my attention is on the viewer; I am not thinking about anything else. Out of session, if I am with a viewer, my attention is on her as a person, or on the subject of the conversation we are having and not on her issues or problems. I can have – and allow others to have – many identities apart from “issues”. How did this happen? I think it goes back to the larger journey, the backdrop onto which this secondary journey is laid. Because my experiences as a viewer have allowed me to handle a major portion of my own past issues and problems, these don’t get triggered when I am working with others or in most social situations. I view the process of facilitation as a journey that parallels the journey of a person through life. I am helping people along this journey. 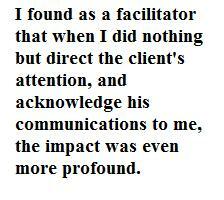 My work with them as a facilitator represents only one small portion of their journey. That viewpoint allows me to see and appreciate the whole person instead of just the part of the person that is unhappy and in pain. As a psychologist, this gives me much more freedom. I know I can help people. When I came across a problem as a technical director while drawing up a program for a viewer, I know I can adapt techniques to solve the problem, or ask someone else for input, and so ensure that my session agenda is in place well before I go into session with the viewer. I know that in my work, people get better. They get lasting results, and my certainty of that gives me the courage to try new things and the strength to stick by someone when things are tough. Though I know that I have limitations and that current Applied Metapsychology theory has limitations, this isn’t a problem for me. If I can’t handle something, I refer to someone who can and in the meantime I try to come up with a way to expand the theory and techniques to address these things by communicating with other fully trained colleagues. In Applied Metapsychology, I have finally found a solid theoretical base that is nonetheless capable of expansion and change, and which lends itself to the development of new applications. This is very exciting for me. I have discovered that when I apply to a given area of psychological difficulty the basic concepts and principles of metapsychological theory – the Rules of Facilitation, the principles of effective communication, the concepts of having, of time and attention, of repetition, and so on – I can expand upon the theory and build new applications. As far as I am concerned, this is the true value of a good theory. A second mark of a good theory is its testability. Though research has its limitations because of the limitations of measurement instruments and in generalization from one subject group to another, it has value nonetheless. In my view it is essential to be able to show that various techniques do produce measurable changes. I suppose part of the reason I feel this way is that the field of academic psychology relies on research. Despite the fact of its never having been proven to work, psycho-dynamically oriented therapy is still in very common usage. This is because it hasn’t been disproved either. If you ask a client who has been undergoing psychoanalytic treatment for a few years what kinds of improvements he has experienced, he will probably reply with general statements and “feeling based” statements, and no specific statements of change. If you ask a viewer who has had some kind of facilitation what kinds of improvements he has experienced, he will probably reply with some general statements but he will also be able to give you specific statements of change: feelings have changed, behaviors have changed. I am not invalidating the gains an analysand may have experienced. However, I believe that people initially go into therapy not because they are seeking growth, but because they wish to relieve pain and to resolve difficulties. I don’t feel today as if I have done my job correctly if a client leaves me without having thoroughly resolved at least most of the difficulties he came into viewing to address. The desire for growth is a good reason to continue in any kind of viewing activity. In my experience, though, it is not usually sufficient motivation to start any kind of viewing activity. This doesn’t mean I will turn away a viewer who comes into viewing for self-growth. What I mean is that people rarely seek out my help for growth alone. There is almost always some area in their lives they are unhappy with that has prompted them to see a therapist or to do some viewing. So the fact that we can test these theories and techniques is very appealing to me. My doctoral dissertation is a treatment outcome study comparing TIR, another treatment, and a control group for outcome with crime victims who have Post-Traumatic Stress Disorder. However as well as advocating that we undertake controlled treatment outcome studies on Metapsychological techniques, I would like to recommend that practitioners start collecting data for single subject design studies routinely. Single case studies are a valid method of testing a treatment technique. They are not very difficult to design or interpret, requiring merely that one get together some good instruments and ask new clients to complete them – pre-viewing, post-viewing, and ideally again at a point perhaps six months after they have completed viewing.. If you do enough of them, they add a lot of new information to the field. I think this would be a very valuable project to undertake for those of us using Metapsychology techniques. I feel a responsibility to discover and prove what works with whom and if possible why. This information helps me to be a better technical director and also helps me to decide what to use and what not to use in the future. Using this theory and these techniques has other benefits for me. At the end of a long day of facilitation, I don’t feel drained as I often did when I was using other techniques. Most of the time I know I have accomplished something, so I don’t feel frustrated as I used to be in the past. When I am upset about a case or having difficulty handling an issue, I speak to my technical director and come up with a new approach. If an issue of mine has been triggered, I have a session. In fact though I may feel tired at the end of a long day, I often feel quite high as well. Being able to watch someone go from confusion to certainty, from sadness to happiness in a single session is a wonderful privilege. It is invigorating. I get the same satisfaction and joy from teaching Applied Metapsychology techniques to others. I value my students and their contributions. I have not yet taught a workshop or a course in which I did not learn something from my students. Their questions force me to examine the theory more closely and often provoke realizations about my own engagement with the theory and techniques. It’s also very exciting to watch my students make some of the discoveries I have made over the last few years about the utility of the theory and its techniques. I enjoy their enthusiasm and commitment. Both my journeys go on and my enthusiasm for the theory and techniques of Applied Metapsychology continues unabated. The more I do, the more useful I find the pursuit. I would like to acknowledge those of you who have played a part in helping me to find this new way of viewing people, the world, and the helping professions.